How can my site get hits through links? How can my website receive hits through links on other sites? In other words, when someone is looking for Medical Marijuana how can my site be linked to their search? So when they go to Google, for instance, I want my site to come up on the list they searched. Thank you. You can do this by adding "Medical Marijuana" to your list of keywords in the Page Properties. 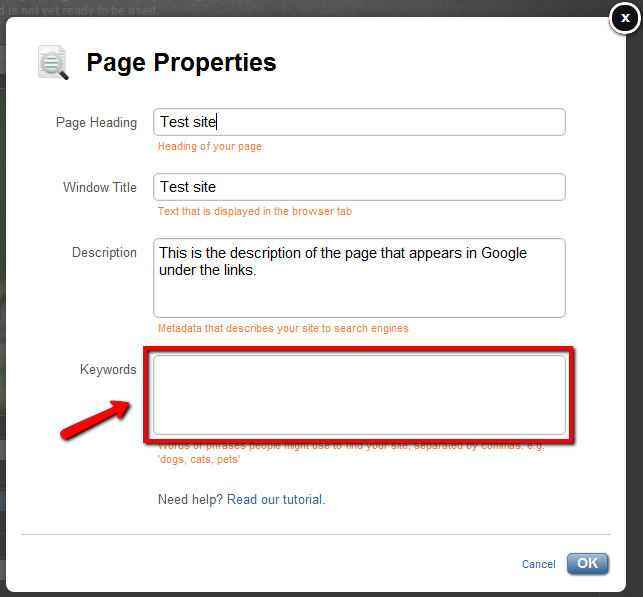 You can enter your keywords in the box highlighted. Nathan has given you a great starting point. You might also want to check out our SEO tutorials in order to help you drive traffic to your website. Thank you Nathan and Laura.